Mohs micrographic surgery delivers the highest skin cancer cure rate while also sparing healthy skin so you have the smallest wound possible. 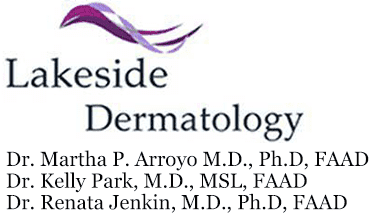 Lakeside Dermatology in Libertyville and Gurnee, Illinois, specializes in the Mohs technique and offers this life-saving cancer surgery to the men and women they treat. If you have questions about Mohs micrographic surgery or you’d like to schedule an appointment, call Lakeside Dermatology today. 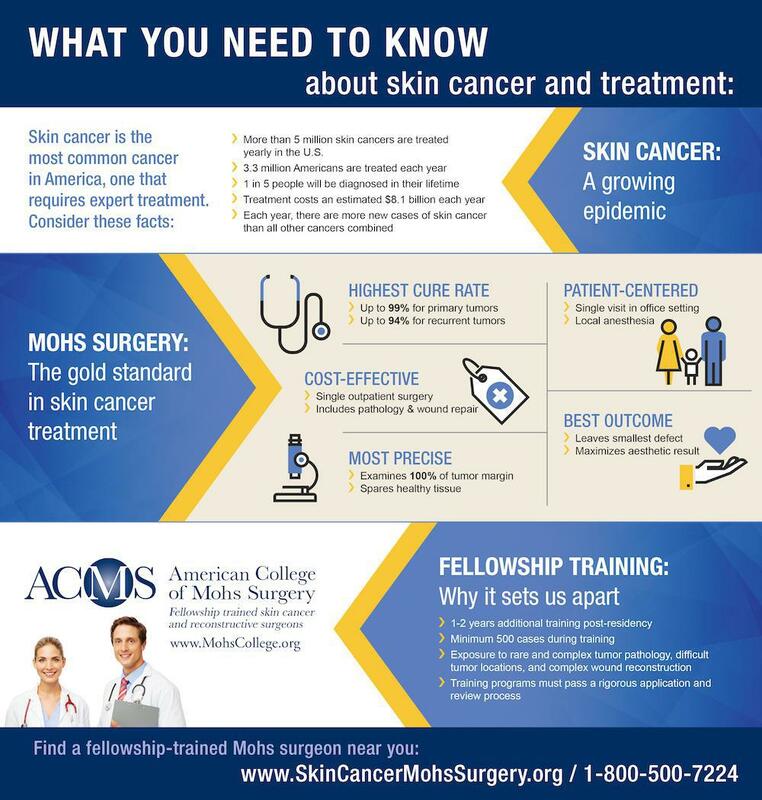 What types of skin cancer are treated with Mohs micrographic surgery? Mohs micrographic surgery is the most effective treatment available for the two most common types of skin cancer: basal cell carcinoma and squamous cell carcinoma. Mohs is especially beneficial for treating skin cancers in visible areas like your nose, lips, chin, and hands where you want to preserve as much healthy tissue as possible. The doctor also recommends Mohs for skin cancers that are large, growing rapidly, or have indistinct edges. How is standard skin cancer surgery performed? During a standard excision, the doctor removes the visible cancer plus a certain amount of tissue from around the margins. Then you go home and wait for the lab results. Meanwhile, your tissue is sent to the lab and examined under a microscope. If the margins are clear, meaning there are no cancer cells, then all the cancer was removed. If they’re not clear, you go back for more surgery. As an alternative to standard surgery, and to give patients superior results, Lakeside Dermatology specializes in Mohs micrographic surgery. 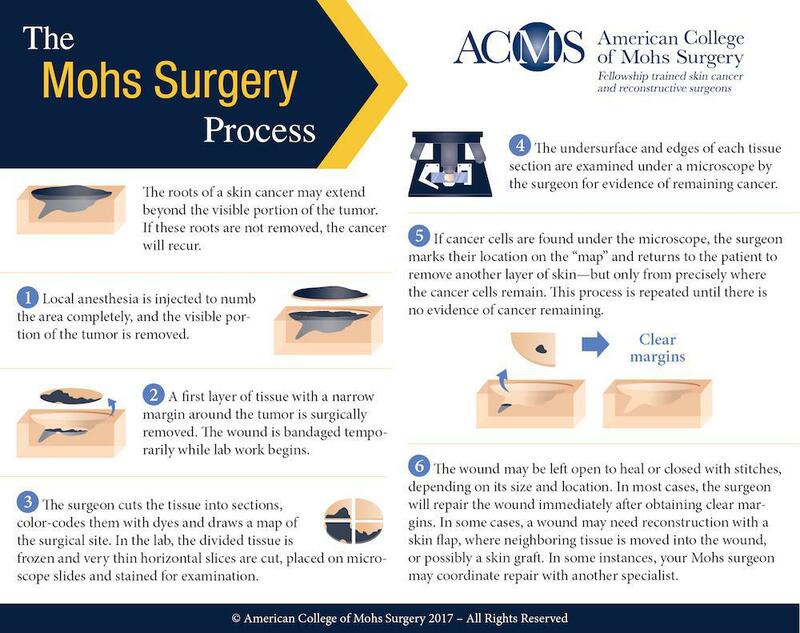 Before starting your Mohs procedure, the doctor makes superficial reference marks around the cancer. This creates a map that identifies where the tissue was originally located before it was removed. The doctor begins your surgery by cutting away the visible cancer and a small margin. The tissue is processed in a way that’s unique to the Mohs procedure, then examined under the microscope right there in the office while you wait. Thanks to the Mohs tissue processing, the doctors at Lakeside Dermatology get a full view of the margins. If they’re not clear, the doctor immediately removes another very thin layer of skin. Using the reference marks, she determines the precise area where the cancer cells in the margin were located and then removes a small layer of tissue from that area. The new tissue sample is processed and viewed under the microscope. This step-by-step process continues until all the margins are clear. What are the benefits of Mohs micrographic surgery? Mohs surgery is done in the office and you go home the same day — with peace of mind. You don’t need to anxiously wait for lab results; you already know your surgery was a success. To learn whether you’re a good candidate for Mohs micrographic surgery, call Lakeside Dermatology to book an appointment today.